Honda’s famed humanoid robot ASIMO has many skills, including running, serving drinks, hopping on one foot, and kicking a soccer ball. And itabsolutely loves to dance. But despite its capabilities, the reality is that most of ASIMO’s actions are pre-programmed, and the humanoid relies heavily on hidden operators monitoring the robot’s every move and triggering its responses, like the man behind the curtain in The Wizard of Oz. 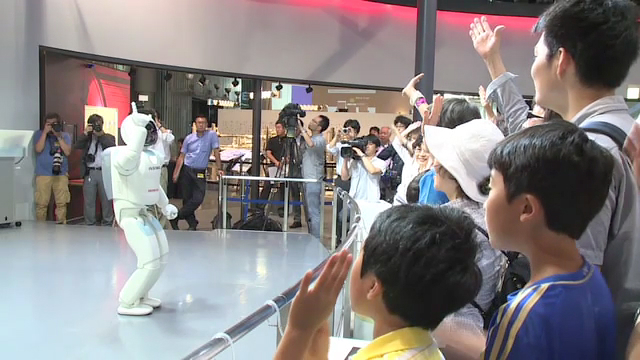 Now Honda wants to change that and it has recently started testing new autonomous behaviors for ASIMO at a Tokyo museum. The new gig, however, seems to have had a rough start.